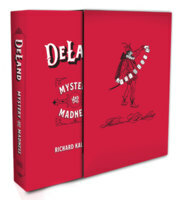 Today, when you order "DeLand: Mystery and Madness by Richard Kaufman", you'll instantly be emailed a Penguin Magic gift certificate. You can spend it on anything you like at Penguin, just like cash. Just complete your order as normal, and within seconds you'll get an email with your gift certificate. THE MAD GENIUS OF CARD MAGIC, Theodore DeLand, created over 100 tricks between 1904 and 1915. He was famous for his ingenious invention of specially printed gimmicked cards and marked decks, which for the first time allowed everyone to perform amazing tricks with no sleight of hand. He was among the most influential inventors of card magic in the 20th century. DeLand’s life has been a mystery for over 100 years, but diligent research has presented famed author Richard Kaufman with the opportunity to reveal DeLand’s deepest secrets, which led to his tragic end, in a book that combines magic with biography in a new way. All of DeLand’s miracles are presented in this lavish 608-page full-color over-sized volume weighing 10 pounds. A full deck of gimmicked cards printed specially for this book is also included. the pips visually morph into the Ten of Clubs (even the little index corner pips change). • FOUR CARDS ARE SHOWN and dropped into a borrowed hanky or a woman’s purse. One by one, each card is removed and displayed, then dropped back into the purse, to show four different court cards. The fourth court card is magically waved over the purse. The spectator is invited to look at the other three cards, which she discovers have turned blank. • A PACKET OF CARDS, the Ace through Ten of Clubs, is freely shown and shuffled. The squared packet is placed face down on the table. The spectator is allowed to cut the packet as many times as he likes. The performer can instantly name the card on the bottom of the packet. If the packet is cut into three piles, the performer can name the cards on the bottom of all three packets. Or, after a shuffle the spectator places the packet into his pocket. The blindfolded performer is able to call out the name of each card before removing it from the spectator’s pocket. • THE TWO RED QUEENS ARE DISPLAYED, one in each hand, and are shown front and back. In full view, the cards magically change into the Jack of Hearts and King of Hearts. No aps. No extra cards. No elastic. No magnets. • FIVE SMALL PLAYING CARDS are spread into a fan. The performer slides them into his closed left fist. One by one, two of the cards are removed. These are waved over the fist and, when the hand is opened, the remaining three cards have vanished. • THE ACE, TWO, AND THREE OF CLUBS are removed from the deck and cleanly displayed. The cards are turned face down and spread on the table. The spectator is unable to pick out the Ace no matter how closely he keeps his eye on it and how hard he tries. The spectator will go crazy when this is repeated. • A GROUP OF SIX CARDS is removed from the deck and fanned to displaying various spot cards and an Ace of Clubs on the face. The cards are genuinely shuffled, then turned face down and dealt into a row on the table. The spectator is given a real die (or an imaginary die, it makes no difference) and asked to roll it out. What number did he roll? He names a number. No matter what number he says, from one to six, the Ace of Clubs is shown to be the card at that position on the table. (No odd counts, no spelling.) The trick can be repeated. • THE FOUR ACES ARE REMOVED from the deck and placed face up on the table. • A GROUP OF NINE CARDS is removed from the deck and spread into a fan. A mix of Aces and court cards are shown. The fan is closed and the packet is inserted into a spectator’s pocket. The performer removes three of the cards one at a time, then asks the spectator to take out the remaining six. He can’t! They’ve vanished from his pocket. These are just a few of the 20 of the amazing tricks created by Theodore DeLand that you can do with the Mystery and Madness Deck (printed by The United States Playing Card Company on Bicycle stock) which comes free with the new book DeLand: Mystery and Madness, which includes over 100 effects by Theodore DeLand.